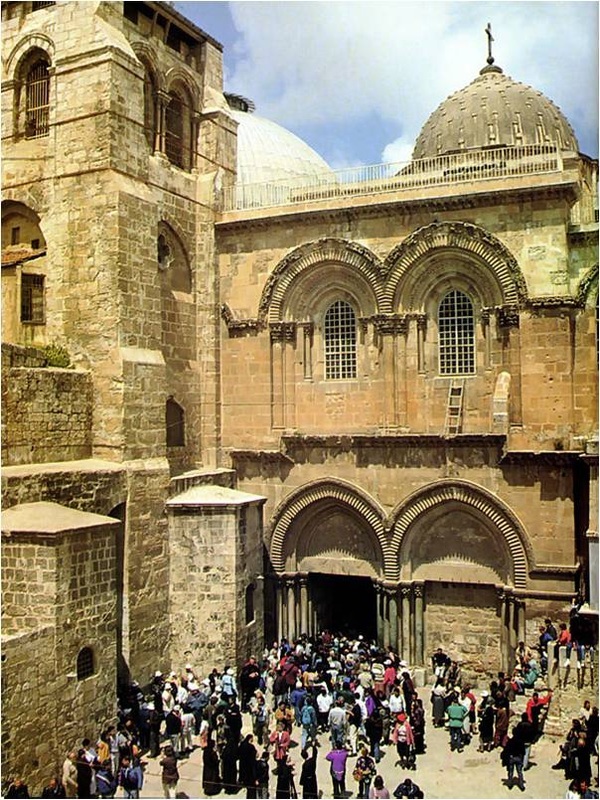 Early Christians visiting Jerusalem wanted to see the sites of Jesus final hours and prayerfully follow in the footsteps of his passion and death. This devotion came to be known as “the way of the cross” or “stations of the cross.” The above map marks the “stations” as marked out in Jerusalem today. The second picture is where the Antonia Fortress, Pontius Pilate’s residence, was located. 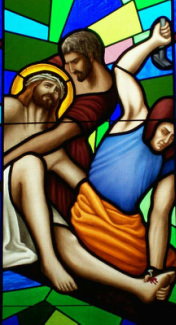 Here the stations begin with Jesus being condemned to death. 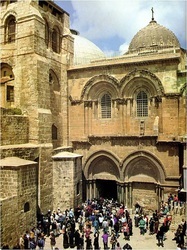 It ends at the last picture, the Church of the Holy Sepulchre, where Jesus was buried and rose from the dead. In the 16th century, when it was no longer possible to travel to Jerusalem, replica shrines of the way of the cross, became popular throughout Europe. 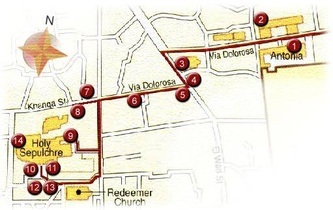 Eventually, the set of 14 stations we now know were formed and they appear in almost every Catholic Church in the world. 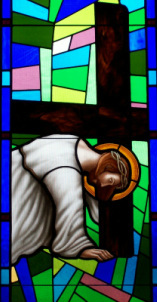 The windows in our parish church depict the fourteen stations of the cross and were donated by parish families. As one journeys with Christ in his passion, one also journeys with a community of faith. The passion of Christ is reflected in the hardships in their own life journeys. The image of Jesus meeting his mother, reminds a family of their sixteen year old son killed in a car accident. 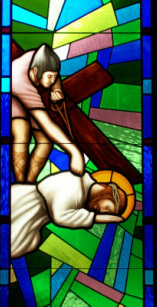 In the image of Simon of Cyrene, we meet a commander who helped many orphans while serving in Vietnam. A window reflects a grandfather's plea (to a boy sent to live with grandparents when at age four, his mother died) that "you should help build at least one church in your lifetime." In the image Jesus falls a third time, a family recalls when a flood, fire at their parish, and job transfer brought them to Iowa. In the window of Mary holding the body of her son, parents are reminded of the death of their firstborn at 19 months. This devotion reminds us of the love the Father has by sending his only Son for us. We are reminded of the love that Jesus has for us - no greater friend than one willing to give his life for us. His passion and suffering reminds us to turn away from a sinful nature and embrace the ways of God. Jesus shows us how to journey through life's hardships and we are reminded he will not abandon us in those moments; never loose hope. They are called stations, because we stay with him for a few moments, pondering his love for us and asking him for the strength we need to imitate his love in our own lives, even in our darkest moments. 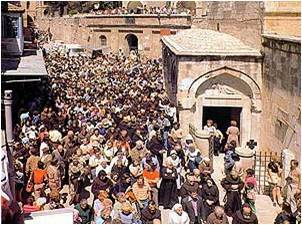 Each year on Good Friday, the Pope leads a torch lit "Way of the Cross" procession which begins near the Colosseum. A different person is selected to write the meditations and prayers for this tradition in Rome. Below are excerpts from Pope Benedict XVI's (then Cardinal Ratzinger)Meditations and Prayers for the Stations of the Cross at the Roman Colosseum, Good Friday 2005. Begin each station with this traditional prayer: We adore you, O Christ, and we praise you, because by your holy cross you have redeemed the world." Then read the reflection, taking a few moments to ponder on Jesus' love for us and our calling to love others. Jesus is condemned to death because of fearing what other people may think. The quiet voice of conscience is drowned out by the cries of the crowd. How many times have we preferred our reputation to justice? Lord, strengthen the quiet voice of my conscience, Your voice in my life. Jesus is mocked, scourged and led away to be crucified. He points out the way of love which leads to true life. Lord, may we never complain or be discouraged by life's trials. Help us follow the path of love and its demands, to find true joy. In Jesus' fall beneath the weight of the cross, the nature of our pride is revealed: the arrogance which makes us think we do not need God and His eternal love. Lord, help us abandon our destructive pride and learn from Your humility. With a mother's courage, fidelity, and goodness, she remained faithful. On the world's darkest night, she became our Mother. Lord, may our faith bear fruit in courageous service and be a sign of love, ever ready to share in suffering. The Cyrenian, walking beside Jesus and sharing the burden of the Cross came to see that it was a grace to be able to help. Lord, help us aid our neighbors in need, even when this interferes with our own plans and desires. Veronica did not let herself be deterred by the brutality of the soldiers or the fear which gripped the disciples. Lord, grant us hearts, simple and pure, to recognize Your presence in this world. Jesus bears the burden of those who have grown weary in faith and abandoned Him. He falls in order to raise us up. Lord, our weight has made you fall. Free us from the bonds of sin. Lift us up so we may lift others up. 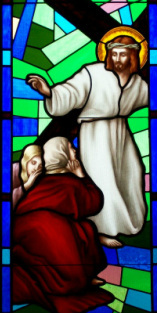 Jesus tells the woman not to weep for Him, but for themselves and children. He shows us the seriousness of sin and of judgment. Lord, help us leave behind the trivialization of evil. Show us the seriousness of our choices. Think of how much Christ must suffer, when in the Eucharist he enters empty hearts. With little respect for Reconciliation where he waits ready to raise us up. Lord, have mercy on us when we betray you. Raise us when we fall. Jesus is exposed to shame, cast out of society. He takes upon himself the sufferings of the outcasts of the world. Lord, give us profound respect for man at every stage of his existence and all situations in which we encounter him. Jesus endured the suffering to the end. He accepted the destruction of His body and dignity. Lord, May we never flee from what we are called to do. Help us to remain faithful to You. Jesus has completed the offering of Himself, He has radically fulfilled the commandment of love. Lord, help us to believe in You, true God, and follow You in our hour of darkness and need, to remember the cross and our salvation. There are faithful ones who remain with him. In this hour of immense grief, of darkness and despair, the light of hope is mysteriously present. Lord, in the hour of our darkness, help us to know that You are still there. Do not abandon us when we are tempted to lose heart. Help us not to leave You alone. Give us the fidelity to withstand moments of confusion. Help us look beyond all our fears and prejudices, and to offer You our abilities, our hearts, and our time. Jesus, disgraced and mistreated, is honorably buried in a new tomb. He has become the lifeless grain of wheat which produces abundant fruit for ever age and for all eternity. Lord, help us grow in love and veneration for Your Eucharistic mystery, to make You, the Bread of heaven, the source of our life. You offer us us Your very self in the Eucharist. Help us joyfully bring You to the world.